Undergraduate degrees are offered by the O'Neill School of Public and Environmental Affairs, the College of Arts and Sciences, and the School of Public Health. Prepare for graduate studies or careers in the fast growing sustainability field in the public, private and nonprofit sectors. Learn about human-environment interactions, sustainable living and our connectedness with Earth on local, regional and global scales. Consider concentrations in topics such as food and energy sustainability and biodiversity. Jointly administered through the O'Neill School of Public and Environmental Affairs and the College of Arts and Sciences. Prepares students for graduate studies or careers as scientists in environmental science or in one of the traditional physical sciences (e.g., biology, chemistry, geology, mathematics, meteorology, physics). Field experience and independent research. Prepares students for careers in government, the nonprofit sector, and private industry. Teaches environmental law and regulation, real-world application of scientific theory, and the science and policy behind sustainable practices. Examines applied aspects of environmental policy. Focuses on basic concepts of outdoor resources, the relationships and interactions of people and outdoor resources, and how to manage them. Topics include outdoor recreation, environmental education, interpretive techniques, outdoor adventure education, nature study, recreation resource management, human health and natural environments and organized camping. 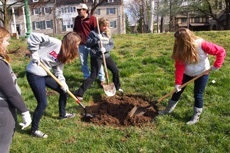 Prepares students for careers in an array of settings–including municipal parks and recreation departments, nature preserves, nonprofit organizations, outdoor adventure organizations, and state and federal agencies (e.g., US Forest Service and National Park Service). Prepares the next generation of environmental health professionals through scholarship focused on the influences and effects of environmental factors on human health and disease. The program prepares health scientists to conduct and share through scholarly pursuits the results of original lab-based research; to emphasize the scientific, technological, policy, and management skills needed to address environmental and occupational health concerns; and to advance the discipline of environmental health. Prepares students for public health professions situated in government agencies, nonprofit organizations, hospitals, schools and universities, and corporations. The B.A. provides a strong liberal arts degree focus on the major subject areas of geography, allowing students to focus on particular concentration areas and/or a second or even third major. The B.S. provides additional science requirements that prepare science-oriented students for graduate school and for science-related jobs at the bachelor's degree level. Concentration areas include Climate, Land and Environmental Change; Food and Agriculture; Geographic Information Systems and Remote Sensing; Globalization, Development and Justice; and Water Resources. Provides training for those who seek careers in the application of earth sciences to the minerals, energy, and environmental industries as well as federal and state agencies, and research laboratories. Designed to perpare students to become professional earth scientists, as well as to attend graduate school for advanced training. Provides a broadly based background in the fundamentals of earth and atmospheric sciences. Offers maximum flexibility in course selection to enhance interdisciplinary study and makes a double major easily accessible to students in related fields. Administered by the Department of Earth & Atmospheric Sciences, through the College of Arts and Sciences. The B.A. trains students in the major subject areas of biology while remaining the most flexible of all biology degrees offered, allowing students to focus on particular concentration areas and/or a second or even third major. The B.S. features more extensive science requirements that prepare science-oriented students for graduate school and for science-related jobs at the bachelor's degree level. Concentration areas include Biology of Disease, Cell Biology and Molecular Genetics, and Integrative and Organismal Biology. Administered by the Department of Biology, through the College of Arts and Sciences.